A new paper published in Palaeogeography, Palaeoclimatology, Palaeoecology reconstructs Sea Surface Temperatures [SSTs] in the Gulf of Mexico during the Holocene and compares them to the Last Interglacial [Eemian] from 115-130 thousand years ago. Data from the paper shows SSTs were up to ~2.5C warmer than during the Holocene Climate Optimum from ~8000 to ~4000 years ago. Since the Holocene Climate Optimum is well known to have been 2-3C warmer than the present, and Pacific Ocean temperatures ~2C warmer than the present throughout most of the Holocene, this would imply the last interglacial was naturally up to ~4.5C to 5.5C warmer than the present. Despite these much warmer temperatures, no climate "tipping points" occurred. During the last interglacial, sea levels were 31 feet higher than the present, sea ice extent much less than the present, and Greenland was 8C warmer than the present. There is nothing unusual, unprecedented, or unnatural about the current warm period or rate of warming in comparison to the rest of the Holocene [past ~10,000 years] or in comparison to the last interglacial, and many other past interglacials, which were naturally much warmer than the present, and therefore, no evidence the current warm period is anthropogenic or outside natural variability. Second graph from bottom shows Sea Surface Temperatures [SSTs] in the Gulf of Mexico during the Holocene [left side of graph] and during the Last Interglacial [Eemian] from 115-130 thousand years ago. SSTs were up to ~2.5C warmer than during the Holocene Climate Optimum from ~8000 to ~4000 years ago. Horizontal axis is thousands of years before the present. Sensitive response of dinocyst assemblages to changes in hydrological conditions. Important differences between the last and present interglacial. Melitasphaeridium choanophorum as minor component of marine sediment. 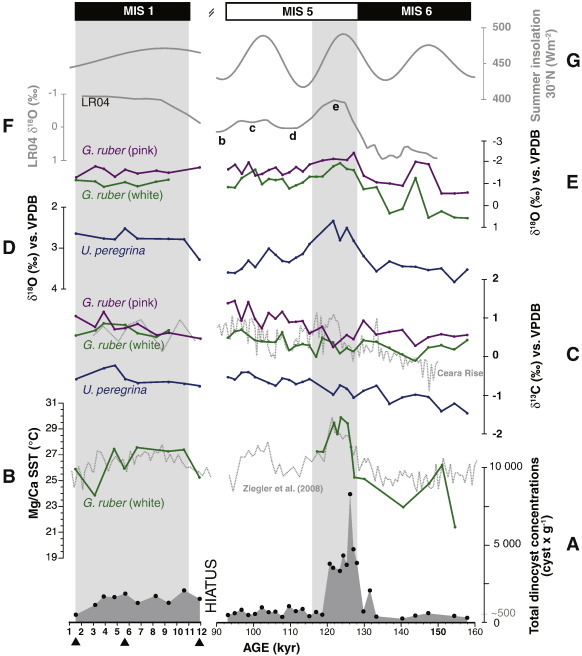 Palynological analyses are used in conjunction with oxygen isotopes and Mg/Ca ratios in foraminifers in order to document the response of dinoflagellate cysts (dinocysts) assemblages to changing climate conditions in the northeastern Gulf of Mexico over the Holocene and late Pleistocene. During MIS 6, but also during the cooler phases of MIS 5, Impagidinium species and Operculodinium centrocarpum were dominating the assemblages. By contrast, during the last interglacial (LIG) and the Holocene, assemblages were mainly composed of Spiniferites taxa and characterized by high relative abundance of Spiniferites mirabilis-hyperacanthus, Operculodinium israelianum and/or Polysphaeridium zoharyi. These two periods exhibit ~ 1-2 °C difference in temperature as inferred from Mg/Ca ratios and show significantly distinct assemblages, with higher percentages of S. mirabilis during the LIG and higher percentages of P. zoharyi during the Holocene. This likely denotes important differences in the hydrogeographical conditions (e.g. surface circulation, bathymetric configuration) between the present and last interglacial. The importance of environmental parameters other than temperature and salinity for dinocyst assemblage dynamics is furthermore illustrated.